I'm writing from the Vancouver airport today/tonight? I had a really smooth trip to Canada, and was actually able to sleep on the plane for about 6 hours! When I checked in, the guy was really friendly, and got me a window seat in the very first row on the upper deck of the plane (I didn't even know the plane had an upper deck!). The extra space was MUCH appreciated. After I woke up, I watched 17 Again, which was fun. The first thing I did when I got to Vancouver was have a Timmy's while I waited for my dear high school classmate Johnny to come pick me up! It was so fun to see him, and when he spotted me, he threw his cell phone up in the air in excitement, it was like something from a movie! We got some Indian food and went for a drive in Stanley Park and saw these awesome raccoons who I swear, were posing for my pictures! I got a tour of CTV where Johnny works, and did a quick wander up and down Robson Street. Today was a once-in-a-lifetime event for us here in Asia. There was a solar eclipse! About 85% of the sun was covered this morning. I tried to look at it with my sunglasses on, and tried to take a picture, which didn't turn out at all. 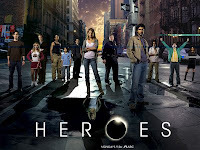 It was pretty cool, but not as cool as the solar eclipse on Heroes. I'm still waiting for my mysterious superpowers to exhibit themselves. 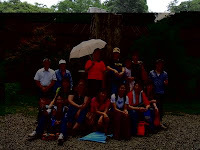 Pictures from a photo scavenger hunt we did at a summer camp in Yilan. Can you guess our team's name?The first word is "The." I was in Taipei after that for 1.5 weeks, which I already blogged about. Great fun. Then I spent a week teaching at the girls' school. They have two classes that specialize in dance, and don't normally take my English conversation class. They were a fun group, but definitely had a lower English level. To whoever decided dancers don't need to learn English: it doesn't make sense. I told them that if they're serious about being professional performers in the future, language skills will be essential. If they ever make it to the international level, or get to do performances overseas, they'll certainly need and use English. It was time for a summer blog makeover, let me know if you have trouble reading/viewing it. 8 days until I go home!! To celebrate the end of the semester, I took a trip with my Bible study students up to a beautiful place in the mountains. Even though we departed from Yilan, Fushan Botanical Garden is actually in Taipei county. It was less than an hour's drive. We had about 30 people total, including the families of some of my students. Since the garden is a protected area, they only let a certain number of people in every day. The day we applied, there were over 1600 people applying for 600 spots! There were tours available I think, but we just went and wandered around. The main path is just under 4km around the more cultivated area. There are signs explaining the different plants and animals that can be seen. We stopped for a picnic lunch halfway through. It was so beautiful there, the pictures don't really do it justice! If you want to see more, you can visit here. One fun thing was that we saw some monkeys from the car on our way in. I LOVE that Taiwan just has wild monkeys running around. Walking down the street in Taipei you get the strangest sensation of heat and cool at the same time. The air conditioner from the stores along the street cools off your left side, as you feel the scorching heat of car exhaust as they go by on the right.